The defective cardboard eclipse viewers fiasco shows the risks of blindly (ha ha) buying from the cheapest seller of some product off Amazon. It’s not even enough to choose a “fulfillment by Amazon” merchant or even a “✓Prime FREE Shipping” merchant, you need to choose the “Ships from and sold by Amazon.com” seller. Despite the Amazon logo, emails from amazon.com, and account and customer service on amazon.com, Amazon remains partly a flea market with thousands of shady sellers setting up booths in it, even when Amazon picks the item off the shelf in its own warehouse and ships it to you. I don’t know if Amazon is legally liable, but Amazon is happy to have people think of it as a better Walmart/Target despite filling most of its store with flea market tables that look pretty much like its own displays. 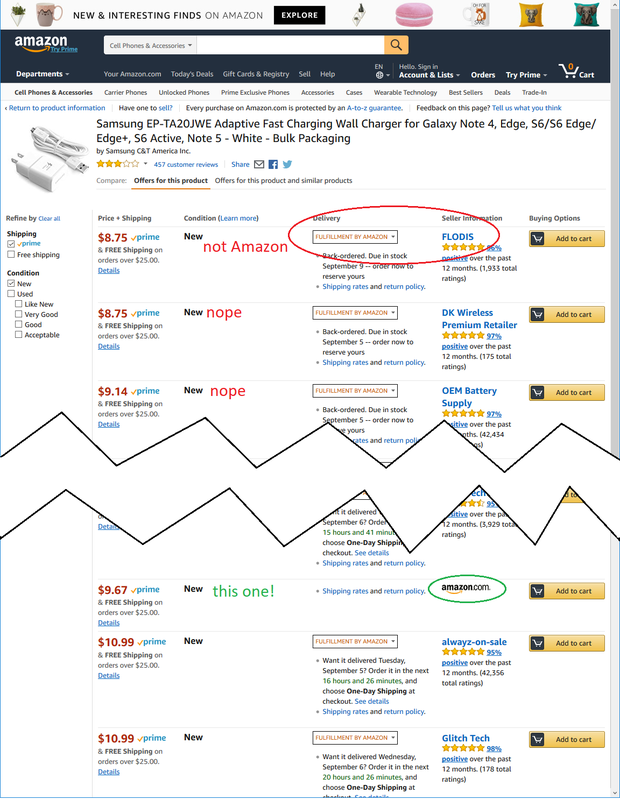 Today I learned that even when you buy the Acme Widget 209666 from the “Shiny Happy Goods Company” seller on Amazon with fulfillment by Amazon and ✓Prime free shipping, the product you get may not have come from S.H.G.Co at all! Merchants can allow their product to commingle, where Amazon puts everyone’s Acme Widget 209666 on the same shelf (well, shelves in its distribution centers worldwide). Hey, one seller’s 209666 is the same as everyone else’s, so why not ship whichever one that’s closest to the buyer nearest the front of the shelf? Answer of course: the widget you get could come from a fraudulent seller with even less quality control than Shiny Happy Goods Co. There seems to be no way to tell if this commingling is going on. I hope stuff “(actually) sold by Amazon” doesn’t engage in this crap. All this raises (not “begs”!) the question, what value do all these sellers add to the Acme Widget 209666 anyway? As I so sagely wrote in Disintermediation part 2, the price floor is the cost at which AcmeWidget Co. is willing to put the widget onto its loading dock. Everything else is overhead. Amazon should buy UPS, take over the world’s loading docks, and get rid of all these crappy sellers. Amazon actually tried to do the right thing with the faulty eclipse viewers. It contacted all buyers to inform them of the defect and credited then the purchase price without requiring a refund. The real problem is lax shoddy supply chains primarily in Southeast Asia. Cutting out all the useless zero-value sellers will let the actual manufacturers of goods compete to build brand names that you can trust.